This was the thing - I was tired of hunting down names of companies or people that we have used on a regular basis in our house. phone numbers, keep receipts or other important information. Then each slot I designated for one member of the family (even our dog) that way any important documents can go in the proper slot. I also labeled one pocket for house needs, and listed the numbers on each of those too. 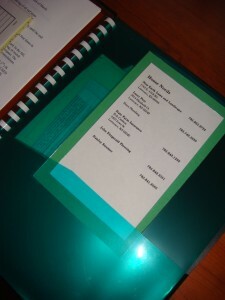 I kept the back of the portfolio open for extra receipts. I find it has been much easier going through one folder than a bunch of them and clearing out what I need when I have the chance. Just thought I’d pass the idea on! 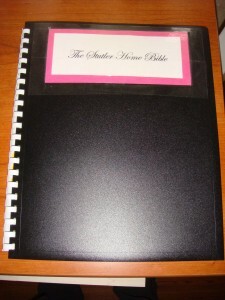 I have a ‘Home Management’ binder that I have that kind of stuff in ;o) It keeps everything from recipes and menus to gardening and home decor. That way everything important to me and my family is in one spot and if we need to go somewhere real fast, I can grab it and not worry about leaving a phone # or something behind! I have a book too but since we have moved, I haven’t had time to get it all together. Doesn’t it feel good to have it all organized and together? 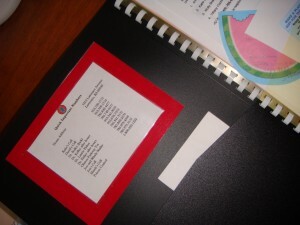 I did one similar but very plain.I took a small binder,the kind with brads already on them and I filled it with notebook paper.I labeled each page with “family”,”friends”,business” etc. It has saved my life many times. I love the way yours looks. Hmm…Maybe I will update the look of mine now! Now that is a great idea! I need to add this to my home decor binder since they could all be in the same binder essentially. I can’t tell you how many times I look up my pediatrician’s number since it is not in a good place.